Earlier today I posted about a Recursive Find Control Extension Method. Since then, I was informed by Steve Smith that I should check out the generic find control method which Aaron Robson has on his blog. He has some pretty nice methods there, so I just adapted them to be extension methods now. As extension methods the code looks like this. /// Similar to Control.FindControl, but recurses through child controls. /// Assumes that startingControl is NOT the control you are searching for. And this new extension method is called very similarly to how we called the previous code. It is called using the following code. It is able to find the Label inside of the the following LoginView. I've also updated my FindControl method so that is just an overload of the previous method. Since my extension method takes the same parameters and returns the same type as the existing find control method I needed to rename it FindControlR. I've now updated it so it takes an extra parameter, but doesn't have a different name. I've added a boolean "recurse" parameter. If this is set to false it just calls the standard FindControl method and if it is set to true it will recursively call itself finding the desired control. This is the final product followed by how one would call it. /// Searches recursively in this control to find a control with the name specified. I hope everyone else sees the great value in extension methods. I usually only open between 5 and 10 Visual Studio projects on a regular basis, so I love the recent projects section of the Visual Studio Start Page. 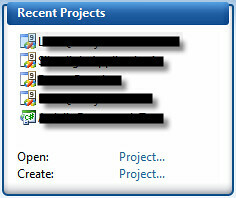 The problem is that when I add projects to my solutions they get added into the recent projects window and it makes it so I now have to go get my solution open from the file system. This irritates me quite a bit. So for anyone who wants to increase the Recent Projects section of the Visual Studio Start Page from this. Just open up the Tools menu item at the top select options and follow the instructions on this nice screen shot. And enjoy not digging into the file system to get to that solution file. Earlier today, as I was working with the Protégé I've been referring to previously, we were debugging some code, and we ran into a little bug. Our tests results would not execute. We tried restarting Visual Studio and a lot of other stuff and it didn't fix it. We eventually just restarted the machine, and that fixed the problem. We figured that even though it wasn't the most graceful solution, it is one we knew would work. This is the error message we were receiving. None of our tests were executing and it wasn't very clear about why. We did figure out that it had to do with the code coverage we had previously been running. These guys managed to recreate the same error a little later, and they found a solution. Here is the solution to this problem. What is going on is that we enabled code coverage and then we decided to start debugging. So we started debugging and clicked "OK" through the message about how it was going to disable code coverage because you can't have it enabled while debugging. Then we hit a break point and decided to stop debugging. All is seemingly still working correctly. We attempt to run the tests again. This is where the %#$^ hits the fan. Suddenly we get that error message listed above and we have no idea why. It just doesn't want to let us execute the tests no matter what we tried. Those budding young developers, as I said, found the error again and that time decided to pursue it further and discovered the root of the problem as well as how to fix it. There is a process called VSPerfMon which is running in the background and is preventing the tests from being executed. It is the program which is running in the background to keep track of code coverage, and if you stopped the execution in the middle of a test it doesn't close correctly. If you kill that process you will once again be able to run your tests. To kill it you can get into the task manager select it from the processes list and end the process. Have fun testing your code with tests that actually run. Since Visual Studio 2008 came out I've been extremely impressed with the software. One shortcut which I believe probably exists in CodeRush and Resharper is the ability to find the using directive needed at any given time. in VS2008 you can press ctrl + . and a little menu will appear which will add using directives for you. This makes writing code so much easier, because I don't have to go to the top of my file to add using statements. I type the name of what I need, press ctrl + . and keep going. I also love using the shortcut snippets in Visual Studio. These snippets allow me to quickly and easily write properties, for loops, etc. I pretty much use these snippets whenever I have one for the task. They only require you fill in the necessary fields. 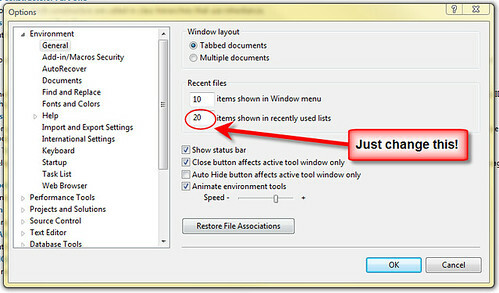 The problem is that when you are filling in the information for one of these snippets it disables keyboard shortcuts. I can no longer have it automatically add my using directive to the top of the file. It will not bring up the menu. In order to get this functionality to work again I have to complete the code snippet I am working on and go back to what needed the namespace added to it. I am then able to use the shortcut to add in my using directive. These are a few examples of snippets I use in Visual Studio. I've been using var a lot lately for my foreach loops since I don't have to worry about this issue with it, but I prefer to avoid var. Yes, I used a using statement in this example so I could write about using a using shortcut to generate a using statement which needs a using directive. Perhaps Microsoft will fix this and allow the keyboard shortcuts to still work while using these snippets. Maybe some of the third party tools already get around this. Resharper? CodeRush? Anyone else? As I've said previously, I am working with developers who are just beginning to learn the tools of the trade. They have a long way to go working with plenty of applications. All people always have more they can learn, so I'll pass along a useful reference here. I found this great reference sheet from Microsoft that has a bunch of key-bindings for Visual C# 2008. It is a PDF poster you can use to reference different shortcuts available to you. While writing some code earlier today I needed to return from within a using statement. Doing these sorts of things always makes me appreciate the using statement and how wonderful it really is, so I decided to write about it here. As many of you know the using statement in C# is a good tool for managing types which will be accessing unmanaged resources. 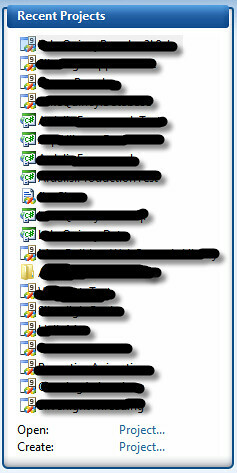 Some examples of these are SqlConnections, FileReaders, and plenty of other similar types. The key to these is that they all implement the IDisposable interface. This means that they all need to be cleaned up carefully after using them. The using statement is great because it guarantees that the declared object is disposed no matter how the execution completes. Whether you reach the end curly brace marking the end of the using statement, throw and exception, or return from a function, the using statement will call the dispose method and clean up the object. This was important in my code because I was able to return directly from within the using statement without worrying about whether or not eh dispose method will fire. Whenever I use an object which accesses unmanaged resources I always always always put it in a using statement. It is very important to use a using statement, because it will give you this guarantee that the object will be disposed of correctly. The object's scope will be for the extent of the using statement, and during the scope of the object it will be read-only if defined in the using statement. This is also very nice, because it will prevent this important object which manages the unmanaged from being modified or reassigned. This is safe to do, because of how great the using statement is. No matter which return we hit we know the XmlReader will be disposed of correctly. Happy coding. Enjoy this powerful tool. Update: I've posted a follow up to this post with a code sample. It shows that you can return from inside of a using statement in C#. Earlier today I was looking for a good reference outlining the differences between structs and classes in C#. I wanted a refresher on the subject, because I've been doing a reasonable amount of teaching lately. At Lake Quincy Media we have hired a couple of developers currently in school. In bringing them up to speed, I've been explaining a lot about programming languages, paradigms, etc. and it is nice to have good references to make sure that I am not passing along misinformation. In my quest to make sure that I'm remembering things correctly I found a great resource showing the differences between C# structs and classes. It is a very nice reference. I has links to different sections and code examples showing the differences it lists. I'll definitely be recommending that these guys take a look at this resource. Note: In my opinion the best one thing to remember when thinking about structs and classes is that structs behave like value types and classes like reference types. If you know how to interact with each of those then you'll understand a lot of the differences right away. I recently downloaded a Vista clock gadget. It is kind of nice, but as with most things claiming to a binary clock, it really is not one. I am bothered by ThinkGeek's binary clocks as well as pretty much all of others I've seen. Don't mistake me here I love the nerdniness factor. They are quite amazing devices to marvel your friends with. The problem is that true nerds have recognized and been bothered since the beginning by these bearers of false names. They are in fact binary-coded decimal clocks not binary clocks. Here is an example of this type of clock. Notice that it keeps a column for each digit of the time. This is because they are using 1 binary number for each decimal digit. This is not true binary. If it were binary there would be 3 columns: hours, minutes, and seconds. I now sit and wait for ThinkGeek to begin selling a real binary clock which is not a binary-coded decimal clock. I should form a group called Coalition Against Binary-Coded Decimal Clocks Being Advertised as Binary Clocks (CABCDCBABC). Yes, I like the name and the acronym is catchy and easy to remember. CABCDCBABC members unite!